Due to the complexity of HDTV reception and processing technology, compounded by the mystery of 18 different DTV broadcasting formats, the volume of HDTV reception related questions increased exponentially in the last couple months. By answering some of the most frequently asked questions, we will share our experience with the readers of the Technical Bulletins. Q: Has the May 2006 analog TV shut-off date been changed again? The question is a reminder of a child’s first time on the swimming pool high board. Back and forth, back and forth. Hugging his chest. Can’t quite jump, but does not dare to climb back down the ladder. The new shut-off date, at the moment, seems to be December 31, 2008. But beside the suggested new schedule, there is no agreement among members of Congress on many other important transition issues. For broadcasters, 2008 looks like a very, very aggressive date. For TV set manufacturers the concern is the digital tuner. Should it be incorporated into every HDTV receiver? And last but not least, the average US consumer wants to know when the current $1,500 price tag for a 36” wide HDTV set will drop to an acceptable level. Q: Can you comment on the so-called Cliff Effect? When analog signal reception degrades, due to fading or inclement weather conditions, analog pictures slowly develop a noisy background. DTV signals react differently. When the DTV signal level drops below a minimum threshold, HDTV pictures just break up or totally disappear. Is there any method to predict those critical conditions approaching the threshold level? The answer: use Bit Error Rate (BER) and Modulation Error Rate (MER) monitors. They help to identify the DTV signal’s proximity to the cliff threshold. BER refers to the number of bits to be corrected by the DTV receiver within a certain period of time. BER level increases considerably before HDTV pictures suffer a catastrophic failure. Traditional spectrum analyzers provide precise signal level and Carrier/Interference ratio measurements, but they lack BER monitoring capability. Q: Is antenna orientation critical to avoid the Cliff Effect? A misoriented antenna can increase the danger of the cliff effect. However, traditional antenna orientation methods may not be practical in receiving distant HDTV stations. In the traditional analog TV antenna orientation technique the video carrier is moved to the center of the analyzer’s screen, while operating the instrument in the 5 dB/Division or 1 dB/Division vertical deflection mode. Then the antenna/antenna-array is rotated to obtain a firm maximum video carrier amplitude. 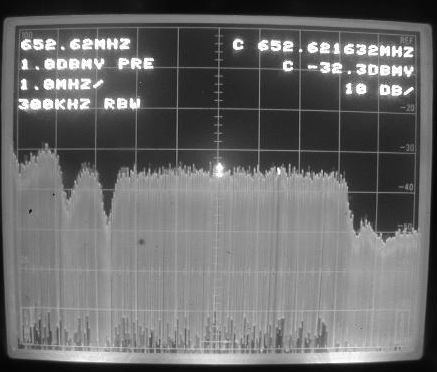 When receiving a local DTV station, the 5.5 MHz wide power spectrum has usually a smooth flat frequency response, as displayed on the photograph below. Help is on the way if you obtained Biro Engineering’s computer developed Signal Direction Sheets, displaying all analog and DTV stations with computer calculated exact directions and Great Circle distances. In most instances analog TV stations are co-located with their DTV affiliates, offering an excellent opportunity to use the analog signals to achieve the proper DTV orientation. 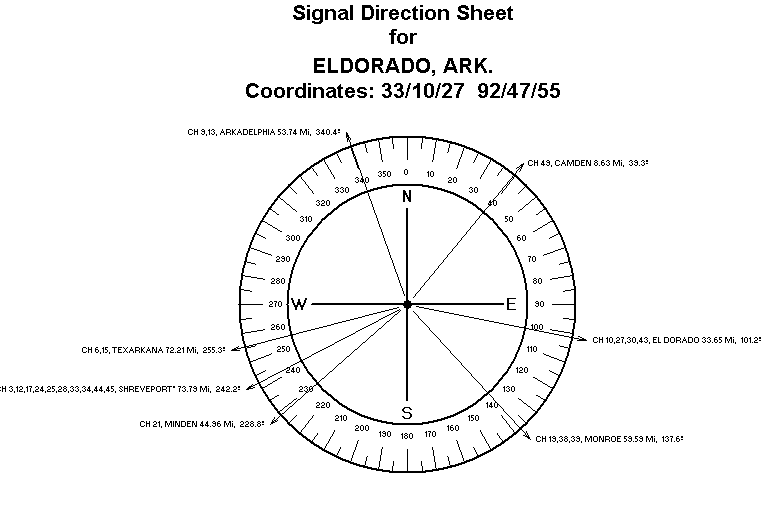 A prime example is shown below on the Signal Direction Sheet for El Dorado, Arkansas. Channel 38, Monroe and its digital affiliate Channel 39 are received from the same direction, 137.6° Azimuth. Peaking the antenna on analog Channel 38 will ascertain the best reception for analog and HDTV signals. An even more interesting case is demonstrated by the Shreveport direction. All analog and HDTV stations are co-located. Consequently, the proper orientation of analog Channel 45 will secure the highest signal level and best picture quality on all four (4) analog and five (5) Digital TV stations. Q: Is DTV the same as HDTV? DTV is a set of 18 different formats, broadcasting TV in a digital format. High Definition TV (HDTV) represents six (6) of those 18 formats. The most popular American HDTV formats are the 720 p and 1080 i. The 720 p format contains 720 lines, scanned progressively, thus starting with the first, followed by the second, third line, etc. Many people think that the 1080i format is superior because the greater number of lines. That is not the case. The interlaced lines introduce instability into the pictures, similar to the old analog 480i format. Whereas the 720p format is offering only 720 lines, the progressive scanning eliminates motion artifacts due to the interlacing. For fast changing picture content, characteristic for sporting events, 720p is the preferred format. CBS, NBC, HDNET and many other services broadcast in the 1080i format. ABC, ESPN, FOX and some other networks selected the 720 p format. Both formats produce great picture quality, and both formats are equally well received by HDTV receivers. On Monday night, had you first watched Everybody Loves Raymond in the 1080i format, then switched to the ABC Monday Night Football, televised in 720p format, you would never know the difference. Q: Can a conventional spectrum analyzer measure the integrated power level? Conventional spectrum analyzers measure the signal level in a 150 kHz or 300 kHz residual bandwidth mode, which is perfectly adequate for analog signal level measurements. 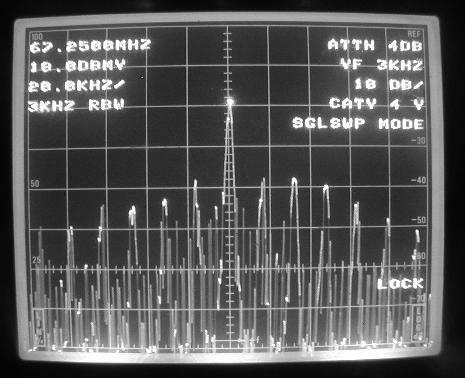 The picture below shows a typical analog TV signal display, with the Channel 4 video carrier in the center of the screen. The analyzer was operated in the 20 kHz/Division horizontal scan and 10 dB/Division vertical deflection mode. The first, second, third, etc. 15.75 kHz line sync harmonics have 20 to 30 dB lower amplitudes than the video carrier. Consequently, 98% of the RF power is concentrated in the narrow video carrier, properly measured by the spectrum analyzer. 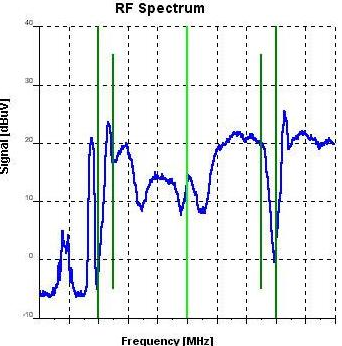 The RF spectrum of an HDTV broadcast signal is dramatically different. 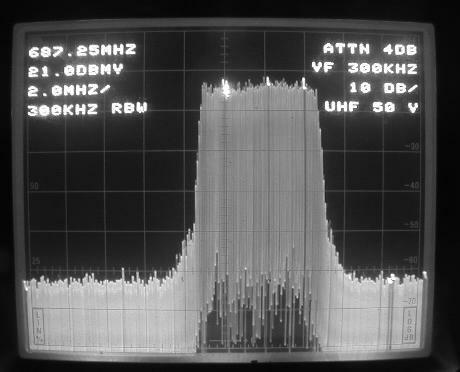 The RF power is evenly distributed over a 5.5 MHz wide spectrum, as displayed on the photograph below. higher than the video carrier amplitude displayed on the screen of the instrument. So, a conventional spectrum analyzer can be used to verify the received HDTV Signal levels, but the 5.5 MHz to 150 kHz or 300 kHz bandwidth compensation must be taken into account. Q: Are HDTV reception signal surveys necessary? Oil companies use “petroleum charts” and spend millions of dollars to create artificial seismic tremors, hiring the best and most qualified geology scientists to predict oil deposits. However, there is no way to tell how deep the high-gravity crude is until they get actually deep down and start pumping. In Cable TV engineering, computer aided High Definition TV reception studies and computer generated signal direction sheets are the perfect tools for the head-end engineer to start an antenna-site relocation project. However, there is no way to predict the intensity of adjacent of co-channel interference until a high quality test antenna is elevated to a reasonable height on-site, and interference intensity levels are recorded from the screen of the spectrum analyzer. A properly conducted on-site verification survey could have provided the necessary warning about the site’s shortcomings. These would include potential power-line noise or ghosting (multipath) problems at or near the proposed antenna site. The unwanted results - interference and ghosting – can be predicted with a properly conducted on-site verification survey.